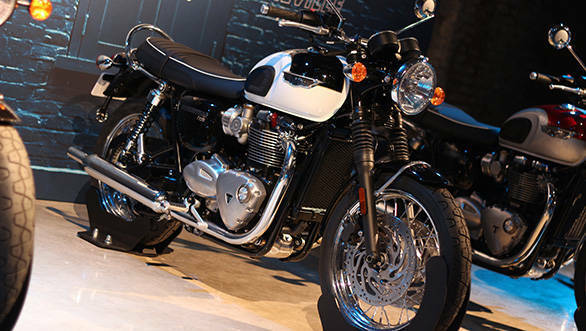 The new Triumph Bonneville is here. This is the third all-new Bonneville since Triumph's resurrection and perhaps the most ambitious one of the three so far. The company says the Thailand-made motorcycles are all completely new and the new Bonneville takes what it does well - a slick, well-made retro flavoured motorcycle - and pushes it to the next level. But before I tell you more about the new Triumph Bonneville, let's travel back in time. About seven days, to be precise. October 21, 2015 is a pretty special day. Primarily because at some point in a movie called Back To The Future, an old man and a young man set their time-travelling DeLorean to this day. I was in London on that day and if the movie'd been correct about what lay ahead, they'd be seeing the new generation of Triumph Bonnevilles emerge from the darkness in a concrete-floored hangar in north-east London. Did you notice the plural? There are now three distinct Bonnevilles. No surprise, right? 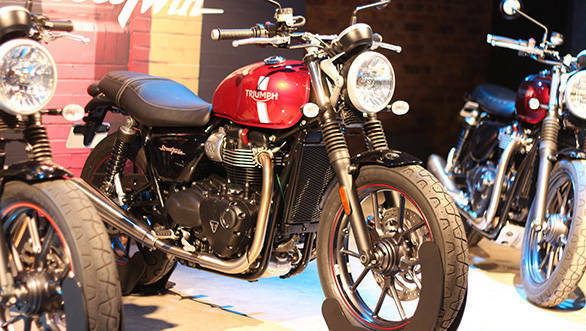 The current range already has an alloy-wheeled base model, the spoke-wheeled T100 and the cafe racer Thruxton. Yes, but the new bikes take the distinctions to a whole new level. What I'm about to tell you does have boundaries though. We were permitted to sit on the bikes, start them up, ask questions to the four top Triumph executives present. But we couldn't ask for specifications or power figures or prices or launch dates. Those were for later. What we do know is that there is a new family of two engines - 900 and 1200cc twins - in three states of tune, a ground-up new chassis with minor tweaks by model family, a slew of new electronics and of course, the new design - the Bonnevilles are completely new. Triumph also showed off parts of its new 470-item parts catalogue for the new Bonneville as well as its new riding gear and clothing lines for the bike. Triumph also highlighted its 'inspiration' kits which are sort of like a list of factory accessories that come together to create a specific look. For example, the Street Twin has a Scrambler Inspiration kit that gives it a high Vance & Hines pipe and bits. 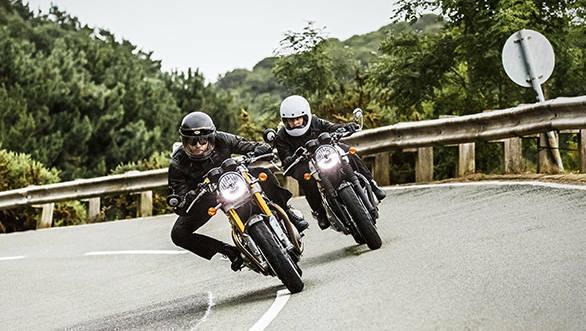 This is interesting because Triumph also confirmed that the Scrambler, America and Speedmaster would continue to be on sale and in production, wearing the current 865cc parallel twin. And now back to the new Bonnevilles whose ignition keys are now in a central location ahead of the handlebars (yay!). The new Street Twin is the base Bonneville. It gets a brand-new liquid-cooled 900cc parallel twin that is fed by one throttle body. The engine makes 80Nm at 3,100rpm, which is not only 20 per cent more than the current Bonnie but also 2,400rpm earlier which is terrific. Triumph adds ride by wire, traction control and ABS to the standard equipment list as well. The Street Twin also gets a slip and assist clutch that lightens lever effort and more. The next higher model is the Triumph T120 and its cosmetic cousin, the T120 Black. These models are unabashedly retro, wearing a more upright set of ergonomics compared to the Street Twin. But the engine makes 105Nm of peak torque at 3,100rpm which is a full 54 per cent increase over the current Bonneville. 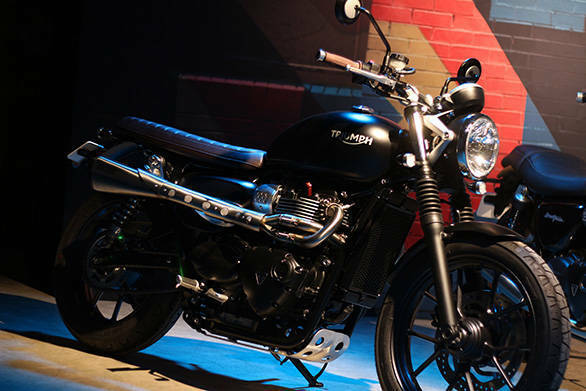 The T120, says Triumph, draws upon the original 1959 model to create a stylish retro look. The standard heated grips, centre stand and the passenger grab rail underline its focus on being a practical machine. The Triumph Thruxton also gets a 1200cc engine but it isn't identical to the T120. This engine not only makes more torque - 112Nm at 4,950rpm but it also makes greater power and revs higher though Triumph wouldn't discuss either in more detail at this event. Styled as an extremely attractive cafe racer, the base Triumph Thruxton now gets a higher spec R model featuring adjustable Showa upside down forks up front, Brembo Monobloc radially mounted callipers and a fully adjustable Ohlins rear shock set. The Thruxton also gets Pirelli's excellent Diablo Rossi Corsa tyres to reiterate its sporty intent. 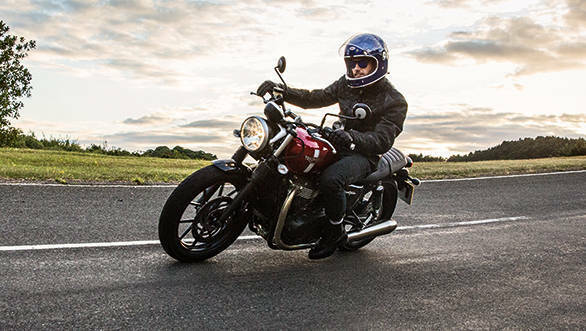 In terms of electronics, the Thruxton spec adds a Sport mode. Triumph says the global reveal is October 28. The Triumph Street Twin's specs and prices should be out in the first week of December. January is the date for the Triumph Street Twin to hit showrooms (not in India, though) and for the prices and specs of the rest of the range to show up. 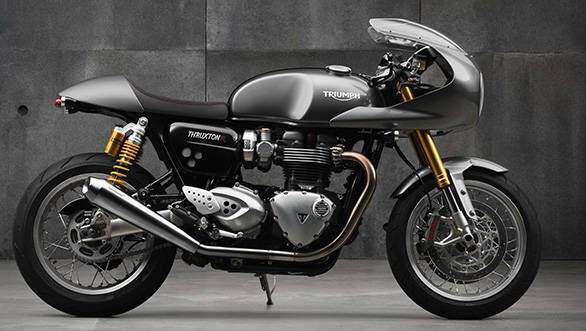 The Triumph T120 and the Thruxton ranges will come to showrooms only in spring 2016. 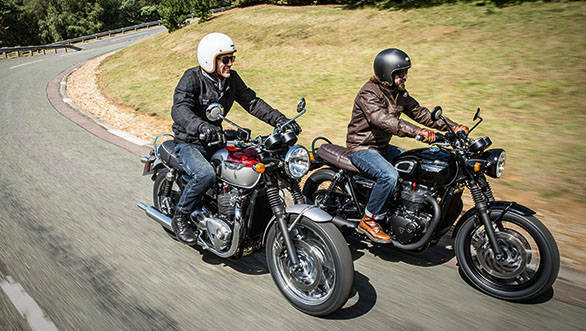 That's a long roll-out and we expect the Triumph Bonneville range to come to India starting March-April 2016 - confirmations are expected.